Having received one of the most thoughtful Christmas gifts (or should I say packages due to the array of contents! ), I'd been mulling over whether to open the conserve below and eat it greedily straight from the jar, or to find another more inspired way? 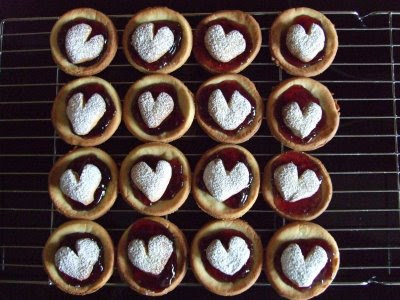 I'm currently reading Jane Brocket's 'The Gentle Art of Domesticity' (aka yarnstorm in blog land) and came across her recipe for Jam Tarts - I love to make pastry as you really feel like part of the process. Jane's recipe was simple, very easy to do and let me get my hands nice and messy - there's something about working out problems as you knead any dough or pastry, definitely a couple of minutes to quiet any tense thoughts! 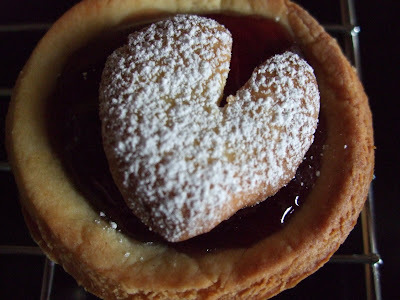 A couple of hours later - in between feeding little wriggly worm, going for a walk and letting the pastry chill properly - 16 hearty tarts were finished. I love the colours, deep red, gold and crisp white against the black worktop (something very Cardinal Richelieu about it); it's given me a little idea for a make - just another one to add to the ever expanding list (okay I really ought to actually write it down soon as my brain cannot be relied upon to keep track of it all!). 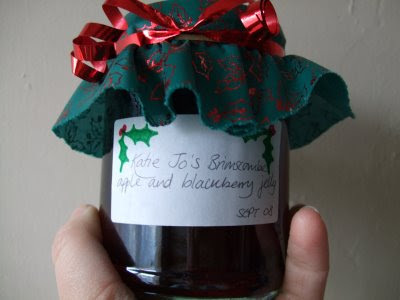 Thank you Katie, a fab jelly and there's still some left to add sparkly rouge glamour to my morning toast!